The Gear S3 will come in two variants—the Gear S3 frontier and Gear S3 classic. Gone is the space-age look that the standard Gear S2 brought, as that's now been replaced by the rugged-looking frontier. The S3 classic, design-wise, is merely an evolution on the S2 classic. The Gear S3 is quite a bit larger and heavier than the Gear S2. 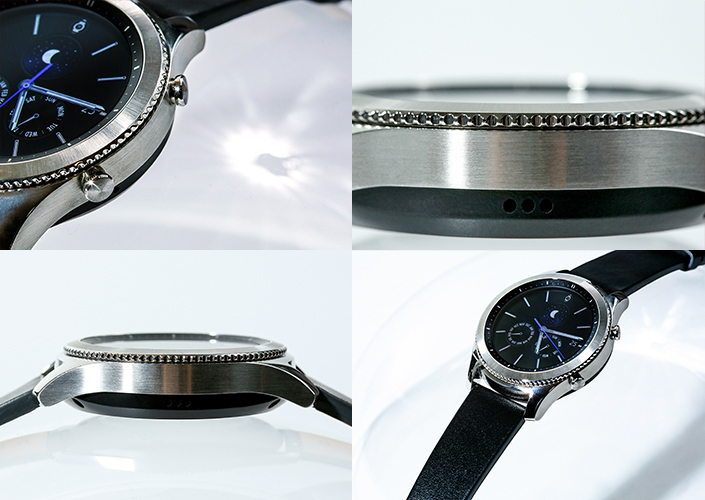 While the S2 was 11.4mm thick and utilized 20mm bands, the S3 is 12.9mm thick and uses 22mm bands. One reason for this increase is a hike in screen size—the S3's is 1.3", 0.1" larger than the S2's. However, the resolution remains the same at 360x360. Samsung is utilizing the newly-announced Gorilla Glass SR+ on both S3 models. Other new features include GPS (a welcome addition), Bluetooth 4.2, 380mAh batteries (compared to the S2s' 250mAh cells), a 50% boost in RAM from 512MB to 768MB, a speaker (which the LTE S2 already had), and MST for Samsung Pay (also highly anticipated). The S3 retains the S2's awesome rotating bezel, dual-core processor, wireless charging, IP68 water resistance, and Samsung's Tizen OS. Like the Gear S2, the S3 will be compatible with any Android with 1.5GB+ of RAM and running 4.4 KitKat+. iOS will also support the S3 in the future. The S3 frontier in LTE guise will be available on AT&T, T-Mobile, and Verizon; however, the S3 classic will remain Wi-Fi only. Wi-Fi models will be for sale at Best Buy, Amazon, Macy's, and Samsung.com. Pricing information has not been announced. 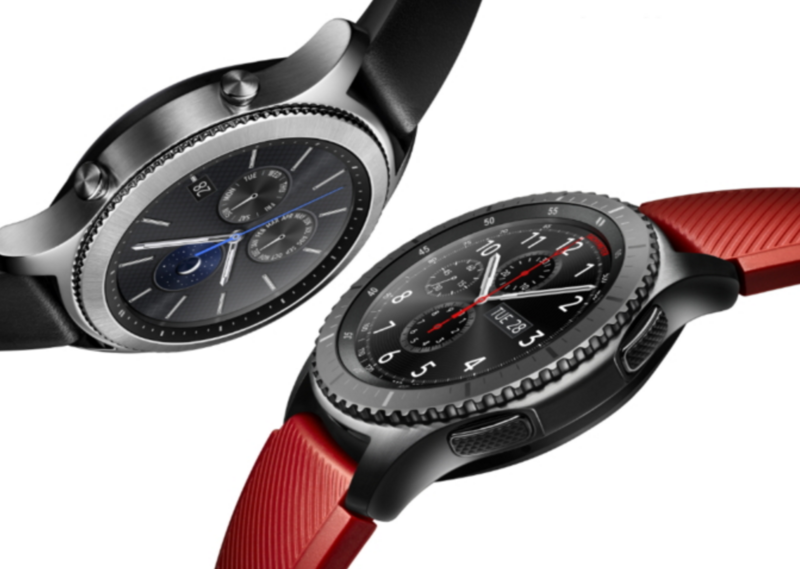 NEW YORK--(BUSINESS WIRE)--Samsung Electronics America, Inc. today unveiled the Gear S3, a striking and innovative smartwatch that further expands Samsung’s diverse wearables portfolio. With the new Gear S3 joining Gear Fit2 and Gear S2, Samsung will continue to meet the varying needs of consumers. Inspired by traditional timepieces and the art of watchmaking, the Gear S3 combines timeless design with the latest in mobile technology, including LTE and Bluetooth connectivity, mobile payments, IP68 water resistance, and built-in GPS. The Gear S3 draws inspiration from the world’s great watchmakers and evokes the contours of traditional timepieces, from buckle to bezel. It is available in two brilliantly bold designs to suit any lifestyle: frontier and classic. The Gear S3 frontier evokes an active, sporty look with an enduring style that blends form and function – perfect for business or leisure. The Gear S3 classic features the minimal, elegant style of many iconic timepieces. The classic model was designed meticulously to attain the same consistency and balance of a well-crafted luxury watch. Both Gear S3 wearables fuse design with cutting-edge technology. With a full-color, Always On Display, the Gear S3 tells time at a glance just like a traditional watch. With both Gear S3 frontier and classic, users can customize the Always On circular UX to complement their personal style. The Gear S3 is compatible with standard 22mm watchbands, so consumers can easily make a switch to match any outfit or special occasion. Samsung will also introduce unique and artistic watch faces and band designs through a special partnership with renowned artist and industrial designer Arik Levy. 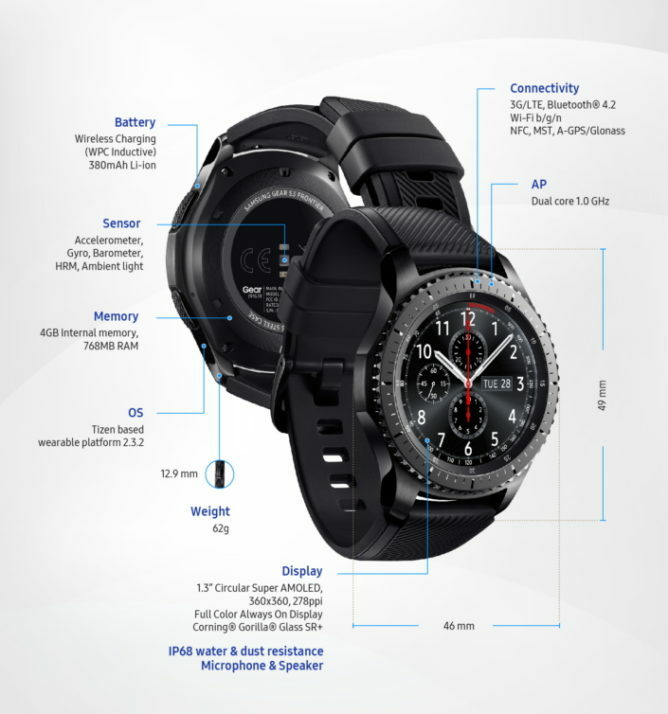 The Gear S3 frontier with LTE further establishes Samsung’s leadership in connected smartwatches. Untethered from their smartphones, users can receive and answer calls in HD, send messages, and use connected apps on the go1. With built-in GPS functionality on both the frontier and classic, users can accurately monitor their daily fitness activities, while the Alti/barometer and Speedometer allow users to track everything from distance traveled to sudden changes in weather. The Gear S3’s built-in speaker activates voice messaging and the ability listen to music on the go. With the Gear S3, Samsung continues the UI innovation that defines its wearables portfolio. With just one rotation of the bezel, Gear S3 users can answer or reject calls and access other key functions. By writing or drawing on the display, messages automatically convert to texts and emojis. Users can also create short reminders and to-do lists to manage even the most hectic schedules with the Reminders application. The Gear S3 combines the stylish design of a luxury watch with rugged construction. In addition to its sleek look, the Gear S3 meets IP68 standards for water and dust resistance2 so consumers can get through their day, regardless of weather conditions. For the first time on the Gear series, the Gear S3 features Corning® Gorilla® Glass SR+, which is specifically designed for wearable devices to provide a tough, scratch resistant and crisp display. Samsung Pay for the Gear S3 also delivers the enhanced security of the industry-leading Samsung Knox platform so users should feel safe and secure knowing that their credit and debit information will remain safe. Consumers can access a diverse range of apps, including fitness, music, news, sports and travel apps—all optimized for the Gear lineup of devices, including the Gear S2 and Gear S3. Through an open collaboration with developers and partners, Samsung continues to enrich its wearable app ecosystem and provide users with a unique smartwatch experience. For the first time ever on a smartwatch, the Samsung Knox Tizen Wearable SDK will be available to third parties, enabling the development of customized applications for Samsung’s wearable ecosystem. The Gear S3 will be available later this year at major retailers, including Best Buy, Amazon, Macy’s and Samsung.com, as well as wireless providers. AT&T, T-Mobile and Verizon will carry the LTE connected version of the Gear S3 frontier. Wireless providers will announce availability and pricing. 1Samsung Gear S3 (frontier/4G LTE) is a companion device for compatible Android smartphones, sold separately. Initial pairing with compatible phone and separate qualifying wireless plan required. Stand alone functionality is limited if paired phone is not powered on or connected to a wireless network. Network coverage not available everywhere. Consult carrier for details. 2Dust and water resistant based on IP68 rating, which tests submersion up to 5 feet for up to 30 minutes. 3Make up to five payments on your Solis without a Galaxy smartphone nearby after initial setup. Reload payment capability by connecting to a Galaxy smartphone via Bluetooth. Only compatible with select cards, carriers and Samsung devices; see the Samsung Pay Support page http://www.samsung.com/us/support/owners/app/samsung-pay#compatibility for compatibility information. Lenovo launches the Yoga Tab 3 Plus, a "personal TV"